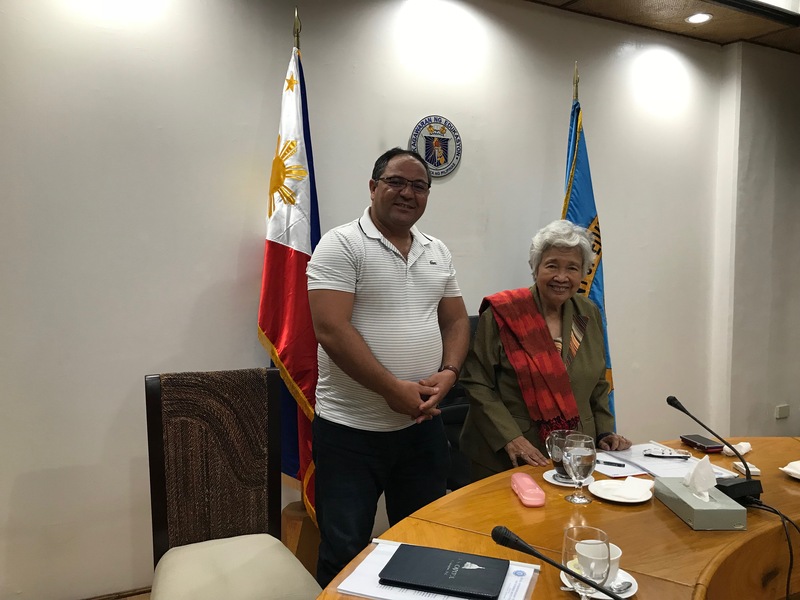 The Department of Education Secretary Leonor Briones and President of the Social Entrepreneurship Technology and Business Institute Dr. Aland Maxell vow to work together to give prison education a boost. 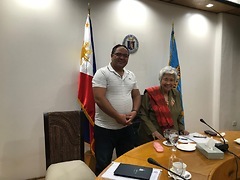 Secretary Briones said the department would work together to further improve the quality of education in the Prison.” I am happy that we here to discuss the development of education in the prison. The Social Entrepreneurship Technology and Business Institute, Inc., in partnership with the Bureau of Jail Management and Penology and the University of Southeastern Philippines, have successfully launched the College Education Behind Bars Project, the first to provide college education among the inmates of the Davao City Jail. During the course of its development, we realized that there are still inmates who cannot fully participate in the program as some are still lacking the requisite Senior High School education. In line with this, we have decided to come up with a Senior High School program in order to cater to the needs of the other inmates. Currently, the Davao City Jail has undertaken a teaching program initiated by the Department of Education of the Philippines called Alternative Learning System (ALS) for those who want to finish high school. However, the Ma-a Jail only offers Grade 10 and does not have the senior high school (SHS) program. Davao City Jail is using the old system consisting of the first year to the fourth year, which corresponds to Grades 7 to 10, also known as junior high school (JHS). Senior high school (SHS) refers to Grades 11 and 12, the last two years of the K-12 program. In senior high school, students begin to study the subjects that will introduce them to their preferred career path. But if they stop at Grade 10, as the Ma-a Jail program does now, they will only receive a JHS certificate, not a high school diploma. Students who belong to the K-12 generation but did not complete Grade 12 will be disadvantaged as they will not be accepted into a college degree program or a technical-vocational certificate program without a SHS diploma. They will also miss the opportunity to learn skills that can qualify them for employment right after the SHS or that can prepare them for starting up a business. According to the Philippine law, at the beginning of School Year 2016-2017, students must go through Grade 11 and 12 to graduate from high school. If Davao City does not have the SHS program, students will only be a Grade 10 completer, but not a high school graduate because high school graduates must have finished Grade 12. The recovery program stands as an essential component of the project to achieve the goals of each stakeholder in transforming inmates into productive high school graduates equipped with knowledge, skills, and values to engage and contribute to their communities. In addition, they will develop as well-rounded human beings who are capable of making the right decisions and regain the dignity and trust they lost through their mistakes. The combined collaborative efforts of the Social Entrepreneur Institute, the Bureau of Jail Management and Penology, Thompson Christian School, and the Department of Education in the Philippines (DepEd) would produce the most effective and sustainable educational benefits for the SHS inmate population mentioned above. SHS students will register at TCS, graduate from that K-12 institution, and get their diploma from TCS. Thompson Christian School will send the teachers to the SEI’s College Education Behind Bars facility to teach SHS students. TCS will also provide modules for SHS students to follow. The SHS students will enroll in Thompson Christian School, read the same school-assigned textbooks and complete the equivalent SHS level assignments as the “outside” SHS students. The only difference is that TCS teachers will travel to the Davao City Jail to teach the courses there, instead of in the TCS campus. Before students enroll in the program, we will assess and screen detainees for basic literacy and readiness for SHS and will document their grade level, vocational assessment needs, length of sentence, and security clearance, etc. The inmates will sign the agreement to enroll in a course and will be monitored for being on their best behavior at all times. To be prepared for college coursework, transitional employment and life demands for cognitive skills, detainees will be advised after completing SH and will be more thoroughly counseled before release. If they are released during their study, they may still continue their education outside. Established in 1959, Thompson Christian School is a nonsectarian, non-stock, nonprofit, and a-political institution offering K-12. TCS provides children in need with the opportunity for a quality value-based education in a safe environment. In addition, TCS desires to develop ethical leaders prepared to work and serve in the modern world. TCS will provide certified instructors to teach SHS curriculum in the jail for the SHS curriculum. Education is a shared responsibility; everyone should advocate for education and take an active part in shaping the future that all Filipinos deserve. Education itself is what rehabilitation in jail is all about. Under this partnership with SEI, the Bureau of Jail Management and Penology (BJMP) is primarily tasked to safeguard inmates. One obligation of the Bureau is to ensure the inmates’ welfare through educational development programs and activities in preparation for their eventual return to the mainstream of society. The BJMP recognizes literacy programs as an important venue in the development and improvement of an inmate as a person. The SEI will govern the management structure of the partnership between prisons and SHS education.The recovery program is a prerequisite for all inmates who are willing to enroll and study in the SHS program. This program is a 12-step program and recovery plan designed to help individuals overcome life issues. People do not change easily unless there is a change of heart. Religion offers mind-shaping knowledge of the way of truth as well as the heart-inspiring motivation to love and care for others. Religion is a relationship between humanity and God. It is the best school for training youth to become the strong timber of the tree of life. From this tree come the fruits of joy, peace, compassion, kindness, and service. Partnership with a purpose can overcome many obstacles and achieve great things. We believe your partnership will help to overcome the drug problem through education. This program aims to provide the inmates, who are mostly drug dependent, the means to advance their education in prison.